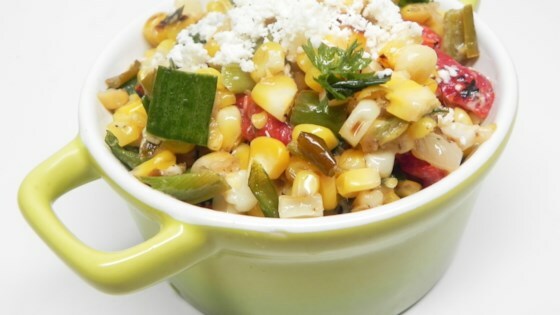 "Corn with roasted chiles, creme fraiche, and cotija cheese." Cut poblano and serrano peppers in 1/2 from top to bottom; remove stems, seeds, and ribs. Place peppers with cut sides down onto the prepared baking sheet. Cook under the preheated broiler until the skin of the peppers has blackened and blistered, 5 to 8 minutes. Place blackened peppers into a bowl and tightly seal with plastic wrap. Allow peppers to steam as they cool, about 20 minutes. Remove and discard skins. Dice peppers. Heat oil in a large saucepan over medium-high heat. Add onions; cook and stir until softened, 5 to 7 minutes. Add garlic and serrano pepper; saute until fragrant, about 1 minute. Add corn, red pepper, and poblano pepper. Saute until corn is tender, 8 to 10 minutes. Season vegetable mixture with salt and pepper. Stir lime juice, butter, creme fraiche, and cilantro into the vegetable mixture. Transfer to a serving bowl and sprinkle with Cotija cheese.